Has your smart phone been dying a quick death every hour or so? If so, you’ve got Facebook to blame. Facebook has finally admitted their updated app is draining our battery power faster than usual. It seems, the new battery menu in iOS 9 is using more than its fair share, and now – through a published statement – Facebook is acknowledging the problem. “We found a few key issues and have identified additional improvements, some of which are in the version of the app that was released today,” Facebook’s Ari Grant wrote in an announcement. A second issue being blamed for some battery drain is tied to the way Facebook handles audio playback. “If you leave the Facebook app after watching a video, the audio session sometimes stays open as if the app was playing audio silently,” Grant said. It’s like when you close a music app, but want to keep listening to the music while you do other things. Only, Facebook is keeping the app open unintentionally and nothing is playing. 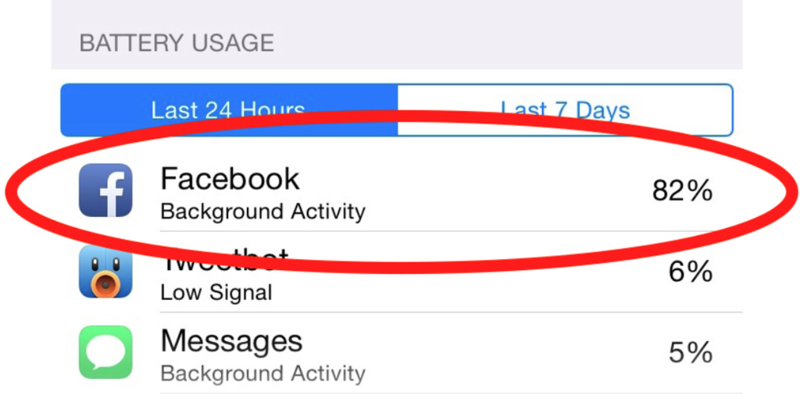 Facebook’s app isn’t actually doing anything beyond draining your battery. I always knew it! What a pain. Facebook has a habit of these insidious little things.